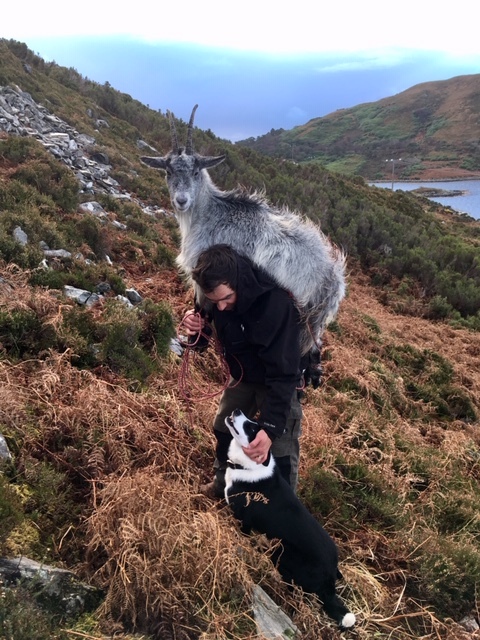 The Old Irish Goat Society (OIGS) is currently based in Mulranny, Co. Mayo where a sample of fine Old Irish Goats was found roaming with the feral goat herds on the mountains behind the village. 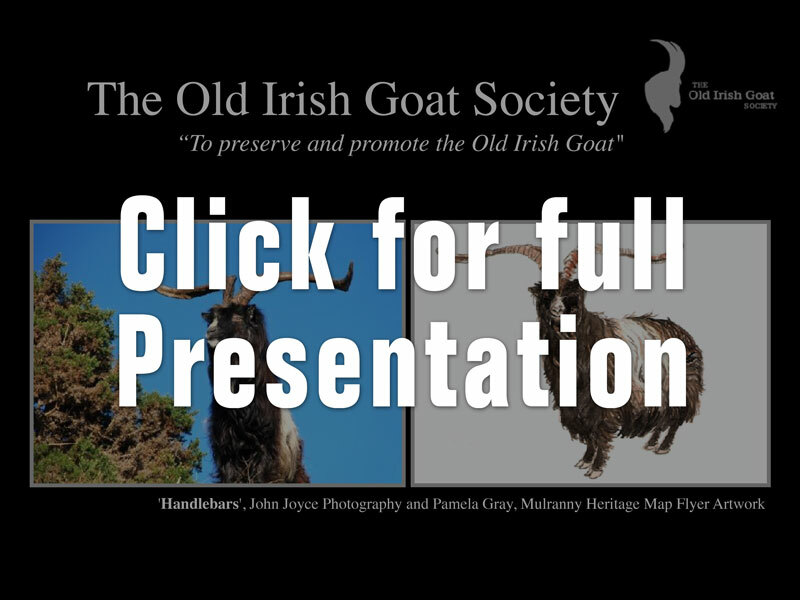 Some introgression had already occurred with domestic stock, but there was enough evidence of the ‘Old Irish’ goat left to inspire a few local residents to remove them from the feral herd and start a breeding program. 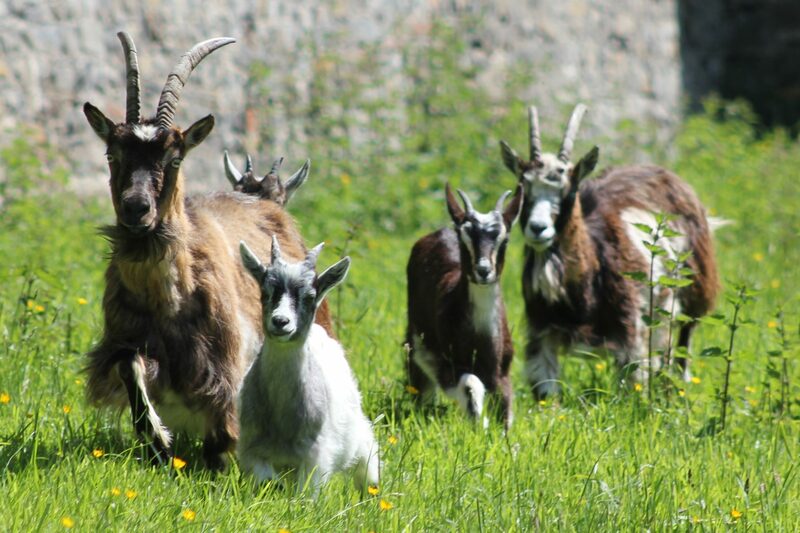 The science required to established the breed took several years as DNA was required from old taxidermy specimens as well as live goats followed by international comparisons made with other goat breeds. This was achieved with the help of the staff at the Smurfit Institute of Genetics at Trinity College in Dublin and help of Professor Hans Lenstra from Utrecht University in the Netherlands. The society has been active in working with the Dept. of Agriculture to establish the breed and also gain recognition of the importance the genetic diversity of rare breeds in general for Irish Agriculture. Now recognised as an indigenous Irish breed, the society has set in motion the importance of saving rare breeds in general, not only for genetic diversity, but for the practical applications of their hardy nature adapted specifically to the Irish landscape and climate. In addition, these rare breeds hold Ireland’s history in their genes, having served the Celts, the Vikings and the Normans as livestock and sustained the population over time. They are a Living Heritage, as much part of Ireland’s history as the stone monuments from ancient times. A comprehensive view of the Society's work can be seen in this presentation.